What makes you trust someone in a professional context? 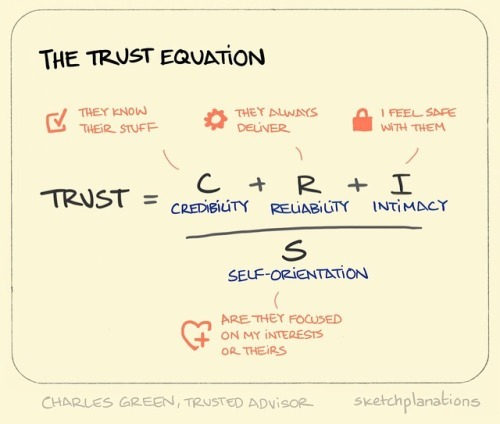 I liked this simple equation by Charles Green which makes it a combination of how credible, reliable, and how intimate — or how safe you feel with that person — divided by the self-orientation of the person — are they focused on their interests, or simply paying more attention to themselves vs being genuinely interested in you and your success. Depending on how you scored this abstract model I guess that would mean that trust is either undermined by someone focusing on their own interests, or strengthened the more they are focused on yours. Also see: the most beautiful equation. Did some awesome person forward this to you? Subscribe to Sketchplanations and get it in your own inbox. Or find me on Twitter or Instagram.